Haley Dewa awaits a pitch at Mary Ellen McKee Stadium. 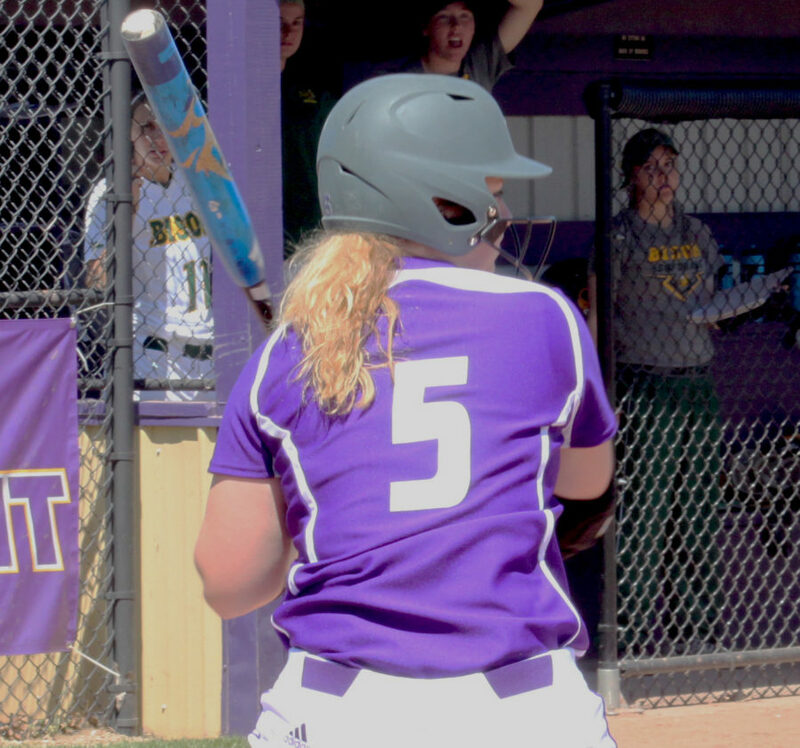 ROSEMONT, Ill. — Leatherneck softball began their season at the Total Control Sports Invitational over the weekend. 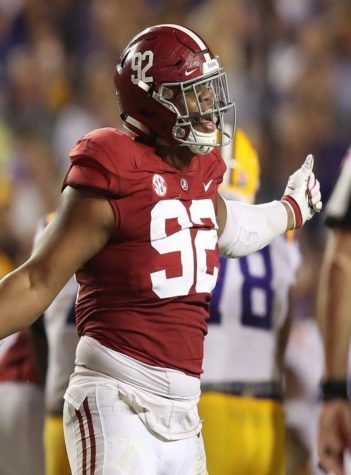 The Necks displayed a lot of power in their first five games, winning three out of five. Western played IUPUI in their first game on Friday morning. 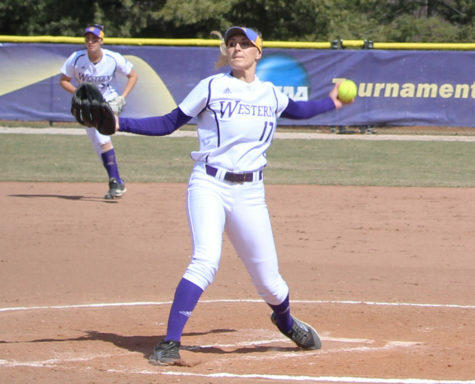 Sophomore Abby Carlin took the mound for the Leathernecks, and she did not disappoint. Carlin didn’t allow a run until the fifth inning, and gave up two runs in 5 2/3. 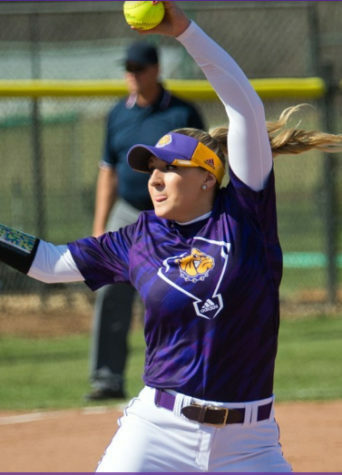 She gave up five hits, struck out two batters and walked one in first outing of the year. The Necks drew first blood, thanks to senior Aly Compton’s moonshot in the top of the fifth, putting the Necks up 1-0. The Jaguars tied the game in the bottom of the fifth, and took the lead on a Kristin London single, giving IUPUI a 2-1 lead going into the last inning. It wouldn’t last for long when senior power hitter Hailey Duwa tied the game, extending the game into extra innings. Senior Payton Abbott hit the Leathernecks third home run of the game, putting them ahead 4-2. Abbott also pitched the last 2 1/3 innings of the game securing Western’s first win of the year. The Leathernecks played Butler later that day. Western played their most complete game of the weekend, beating the Bulldogs 7-1. Senior ace Emily Ira got the start for Western, and she was fantastic as she usually is when she is on the mound. Ira pitched a complete game, surrendering only one run on two and striking out four batters. The Leathernecks offense did the rest. Duwa got an RBI single in the first giving the Necks an early 1-0. The Bulldogs got their only run in the top of the third off the bat from Maddie Moore, tying the game at one. Western got two in the fourth, putting them back up 3-1. They extended their lead scoring four more in the fifth, taking advantage of Butler’s sloppy play in the field. 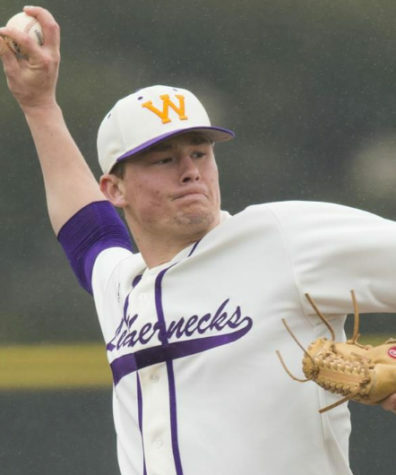 The Leathernecks started the season 2-0, after their first day of competition. On Saturday morning Western played the University of Wisconsin Green Bay who were 1-1 coming into the game. Both teams were scoreless heading into the seventh, until junior Jasmine Lara singled, putting the Necks up 1-0 in the last inning. Green Bay would tie the game in the bottom of the half on a fielding error from Lara. Two innings later the Necks took the lead on Carlin’s sac fly, and got an insurance run when freshman Danielle Olson hit a shot down the right field line, putting the Leathernecks up 3-1 in the ninth. However, Green Bay answered again thanks to Crystal Guzman who drove in her second and third run of the game on her double, tying the game at three down to their last out. The very next batter later, Rebecca Radtke, singled to center field scoring pinch runner Brittney Baneck to give Green Bay a 4-3 win. After a heartbreaking loss, Western played IUPUI for the second time in two days. This time it wouldn’t take the Necks seven innings to score, as they put up a three spot in the top of the first. The Jaguars would answer with three of their own in the second off Ira. The Necks answered right back in the third thanks to a Duwa double. Four batters later, Junior Meghan Henson hit a three-run homer making it 7-3. Both teams would score one more run, giving the Necks an 8-4 win. The Necks played on Sunday morning against the University of Missouri Kansas City Kangaroos who entered the contest at 2-2. The Necks scored first for the fifth game in-a-row. However, they ran out of steam, giving up nine unanswered and losing 9-1 in five innings. Western went 3-2 this weekend and showed a lot of promise for this year. They will travel to Bowling Green, Ky. this weekend to take on the Hill Toppers of Western Kentucky.